For many Americans, Memorial Day has become a welcome extra day off with an abstract significance. We know that it’s a day to remember folks that lost their lives in the course of active military service, but unless you come from a community or family with a direct connection to the armed forces it can feel disconnected from your reality. In a practical sense, the impact of Memorial Day is Macy’s sales mixed with BBQs and a feeling that you should, you know, be reverent of… something. The meaning of Memorial Day is there, it’s something of significance, but it’s important in a way that history is important; it doesn’t feel like it impacts your life right this second. I’d argue that a big reason for that disconnect is that the human element of the day is, for a lot of folks, missing. Especially if you came of political age in the post-9/11 era, “soldiers” and “war” get mixed in with “tools of the Bush doctrine” and “option of last resort.” The place we currently find ourselves, where veterans have had to remind a candidate for the U.S. Presidency that you don’t attack a family that lost a child serving in the armed forces and that it’s not a good look to call a former P.O.W. a “loser” when you never served, suggests this loss of comprehension is pretty widespread. In the U.S., the first Memorial Day observance took place in 1868 to commemorate those that died in the U.S. Civil War. The scope widened as the U.S.’s footprint on the global field of battle grew, and in 1971 an Act of Congress made Memorial Day a federal holiday in honor of any member of the armed forces that lost their lives while serving. In our current state of fractious, vitriolic, political divide, it’s worth remembering that the roots of this custom are in honoring Americans that lost their lives at the hands of other Americans. Anne Helen Petersen‘s incredible, heartbreaking essay about an ex-boyfriend lost to war. It’s a quick read and really captures the humanity that should be the focus on a day like Memorial Day. Petersen’s Luke is a real person, not a structure to be honored at a distance. She loved him up close and that makes this piece all the more impactful. This short documentary about The Fallen Project, an art piece designed to give concrete reality to the abstract idea of life lost in war (also, the image in this article’s header). 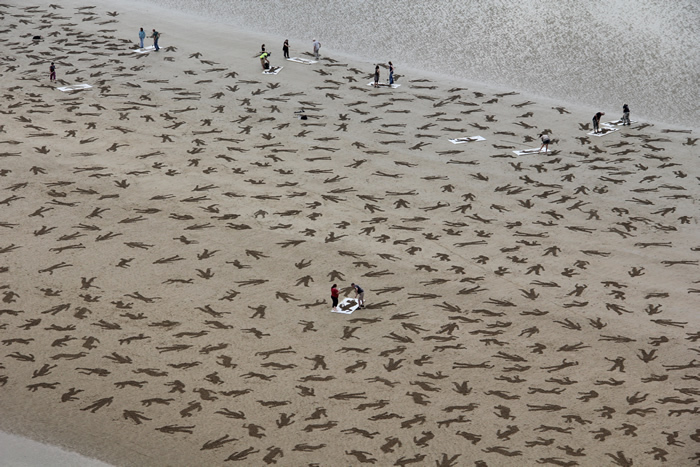 Two artists wrangled a team of volunteers to etch outlines on the sand of Normandy’s beaches to represent the 9,000 people lost on D-Day in World War II. A longform read if there ever was one, but Scott Anderson’s “Fractured Lands: How the Arab World Came Apart” puts the work that the U.S. Armed Forces are currently in visceral context. Focusing on stories of people across the Arab world impacted by the invasion of Iraq in 2003 and its far reaching impacts, “Fractured Lands” offers a broader understanding of how complicated and human the situation “over there” really is. Finally, the folks at Vote Vets made this ad to show that soldiers are real people with real needs that current government proposals really do not serve.